Hand Lettering for Relaxation presents 52 beautiful, whimsical and fun hand lettering techniques based on motivational themes. 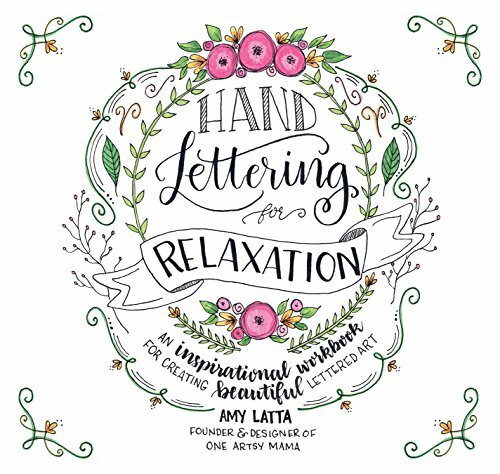 Readers will love the opportunity to practice the creative art of hand lettering in a way that inspires them and helps them relax. Hand Lettering for Relaxation presents 52 beautiful, whimsical and fun hand lettering techniques based on motivational themes. Readers will love the opportunity to practice the creative art of hand lettering in a way that inspires them and helps them relax. As an example of what's inside, Workshop 1 encourages readers to renew & recharge by writing, It's me time, with the easiest technique for a scripted, calligraphy look. Workshop 2 builds on the theme as readers use their skills from Workshop 1 to write, 'Practice makes progress,'and add a new skill of drawing laurels and wreaths that take their calligraphy to the next level. With each workshop, readers are inspired with a brief introduction reminding them to relax and cultivate joy, then learn step by step how to letter each word of an example lettered design and draw embellishments. With plenty of practice space and a page to draw their own final design, this interactive workbook meets readers' every need. High quality, thick art paper allows readers to utilise their favourite pens and markets, then cut out their finished hand lettered art if they wish. This book is the perfect gift for yourself or friends and family who love crafts, drawing and colouring.